Why We Convert Word to Text? How to Convert Word to Text? 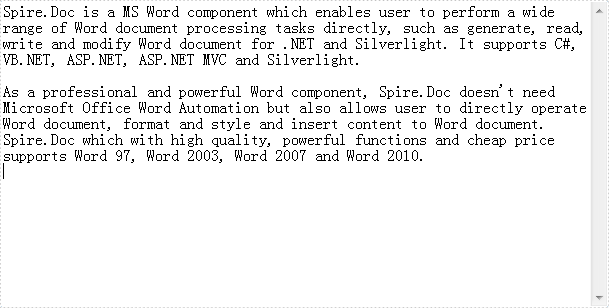 Spire.Doc is a MS Word component which enables user to perform a wide range of Word document processing tasks directly, such as generate, read, write and modify Word document for .NET and Silverlight. It supports converting files from Word Doc to Text, HTML, PDF, XML, RTF, Docx, Dot, etc. Download Spire.Doc (or Spire.Office) with .NET Framework 2.0 (or above) together and follow the simple code below to convert Word to Text. Step 1: Create a project in Visual Studio. Add Spire.Doc DLL as reference. Step 2: Use the following code to load local Word docfile which you want to convert to Txt file. Step 4: Write the following full code into your project and press F5 to start it. Then, a Txt file will be automatically generated.